Heck, they're doing it for the Taurus', how about the Rossi's? Colts', S&W's, Browning, Walther, Star, Makarov, Radom, North American, etc. Re: Let's see your Rossi Revolver photos! Nice. When I get my 972, I'll try and get a pic up in here and for the gallery. VINCENT, vampyredark, Martymobilia38super and 6 others like this. 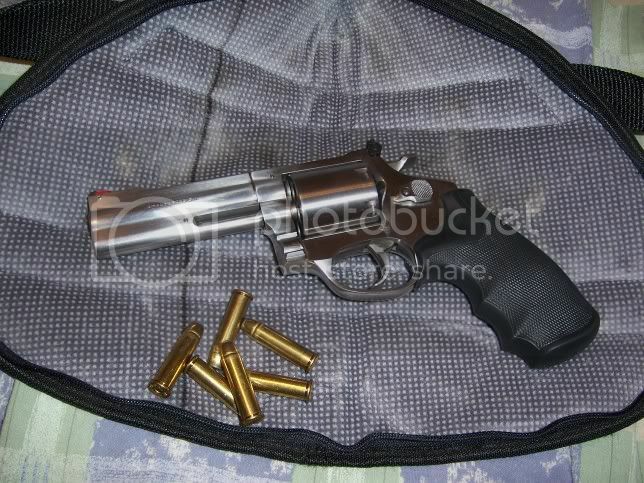 Here's a picture of my wifes Rossi .357. She loves it, real sweet shooter and she's darn good shooting it too. IIRC it's a M711 4 inch nickel plated, bought this one 20+ years ago. VINCENT, VILLAGE, leejack and 7 others like this. If guns are outlawed then I will be an outlaw!! Looks just like my old 971. I took the red ramp out of the sight, was really poorly fitted, but it sure was a good shootin' gun. Top pic is me with a kill I made with that Rossi. polishing to do on it. Nice little shooter. When the last trumpet sounds, I'm outa here!